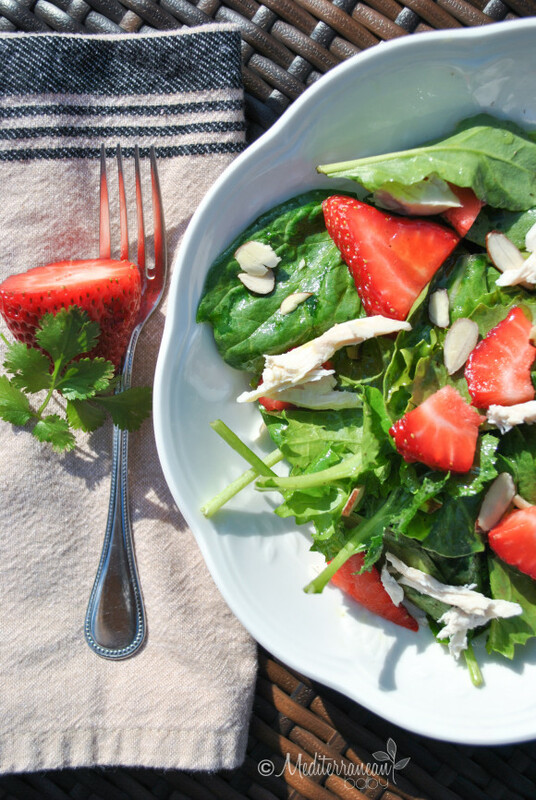 This Strawberry Superfood Salad is packed with SUPERFOODS, of course! What are superfoods you ask?? Well, one week ago I would have been wondering the same thing, but I think I have a better grasp of them today. Last weekend, I had the great privilege to attend BlogHer Food ’14 in Miami, Florida. (I will be filling you in on all of the details later this week!) At the conference, I enjoyed a very informative presentation about superfoods. After listening to the experts, superfoods are vast, complex, and ever evolving, but to oversimplify them, they are REAL, versatile foods with fiber, flavor, and at times, cancer fighting benefits! Sounds great, right? I was so thrilled to hear that foods from the Mediterranean got a huge shout-out from Dr. WendyBazilian. Whew…we are on the right track! Thanks to Sam’s Club, I had a great blend of organic baby greens (baby kale, baby spinach, baby chard, and carrots). 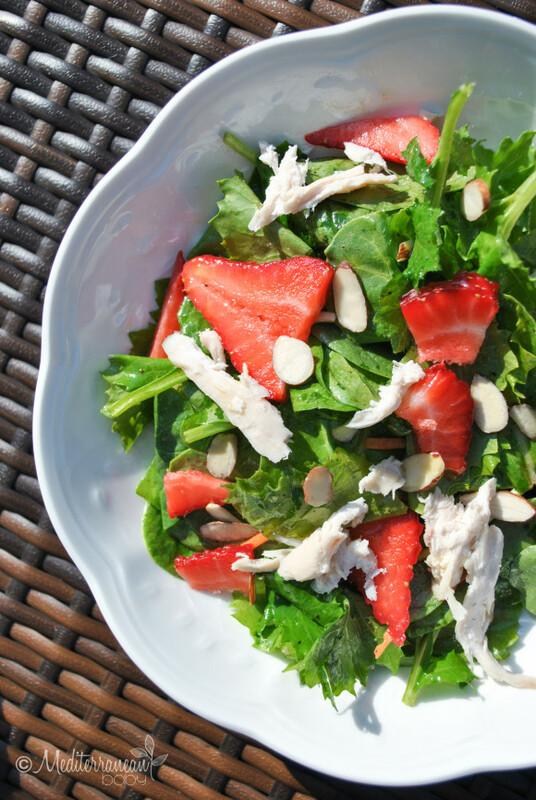 I also had strawberries (a staple for the kids), sliced unsalted almonds, and some leftover rotisserie chicken. Using some agave, apple cider vinegar, olive oil, and cilantro, a fresh simple dressing was born, too. I have to say, this mommy salad takes the cake! Feel free to substitute some other superfoods into this salad, like blueberries or fresh ginger, depending on what’s in your kitchen today! To learn more about superfoods, please read the transcript of the BlogHer Food panel discussion with Dr. Bazilian, Dr. Melanie Palomares from the City of Hope, Jaden Hair from Steamy Kitchen, and Stacy Morrison, Editor-in-Chief for BlogHer. In a small bowl, whisk together all of the dressing ingredients. Set aside. 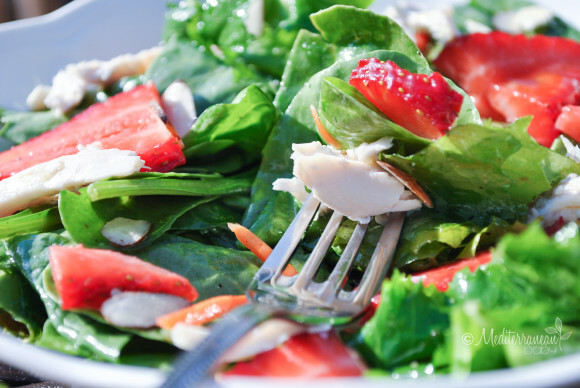 In a large salad bowl, add all of the ingredients for the salad. Toss the dressing with the salad and serve!